Home MTAANI NEWS Kiambu Leaders kick off Uhuruto ‘BIRTHDAY EDITION’ campaign in Thika. 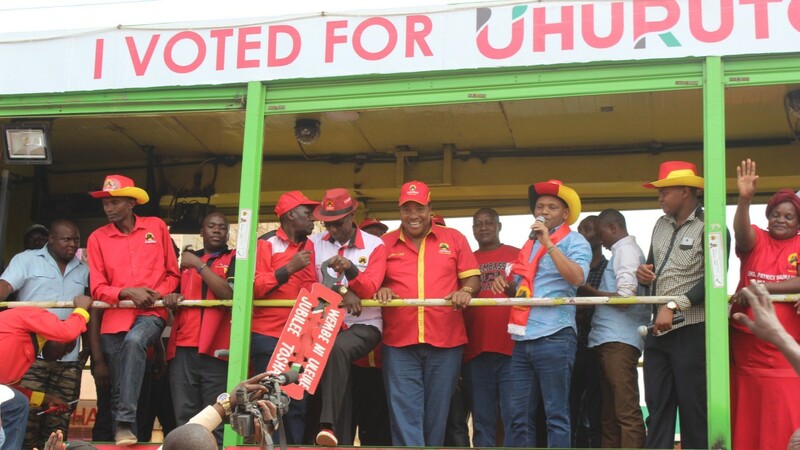 Kiambu Leaders kick off Uhuruto ‘BIRTHDAY EDITION’ campaign in Thika. Host Thika MP Eng. Patrick Wainaina, franked by Kiambu Governor Ferdinand Waititu, MPs Francis Waititu (Juja) and Simon King'ara (Ruiru), addressing the residents of Kamenu Ward at Kiganjo Estate during the launch of UhuRuto 'Birthday Edition' Campaigns in Thika on Saturday. Several leaders from Kiambu County hit the campaign trail in Thika for the election of President Uhuru Kenyatta in the October 26 presidential rerun on Saturday. The leaders who included Governor Ferdinand Waititu (Baba Yao), MPs Eng. Patrick Wainaina Wa Jungle (Thika Town), Francis Munyua Waititu Wakapee (Juja) and Simon Ng’ang’a King'ara (Ruiru), traversed all the constituency’s administrative units drumming up support for the president and urging the people to get out in very large numbers to vote for President Uhuru Kenyatta. The leaders recited the need for 100% voter turn-out, saying that a resounding defeat for the Opposition brigade would put to rest the tension and uncertainty in the country over the presidential rerun that was ordered by the Supreme Court which ‘robbed’ Uhuru Kenyatta of his deserved victory. While underscoring the fact that quite a good number of people in the constituency did not cast their vote in August, the leaders urged voters to turn up in large numbers, saying if all the votes in the region are harvested, the president’s was assured of an overwhelming victory. “This is our last chance to silence this man (Raila Odinga) for good. This guy has some dirty cards hidden within his sleeves that he intends to unleash and get us of guard if we aint very careful. We need to go out and mobilise all the potential voters to get out and cast their votes for President Uhuru Kenyatta,” said Gov. Waititu. He warned the opposition that the Jubilee Party will not allow the NASA brigade to force any form of transitional government that forced a NUSU MKATE government, arguing that this kind of arrangement was unconstitutional. Eng. Wainaina warned NASA that, as leaders who supported President Uhuru, they will not accept any further monkey business from them or any other institution that was being used to play dirty political games that were geared towards any form of shared government through the back door. He promised to work with other likeminded MPs to institute a bill in the National Assembly that would review sections of the constitution that were currently being abused by the opposition and some arms to government to subvert the will of the people of Kenya. “We must relook at some of these sections of our constitution so that we protect the sovereign rights of mwananchi from being abused by those in positions of power. Even though we accepted the Supreme Court ruling, I can categorically say here that the decision of the majority was skewed to favour the opposition. We cannot allow such forms of abuse of office to prevail unquestioned. It is against any form of democracy,” he said. He pleaded to the people of Thika to give President Uhuru Kenyatta a perfect ‘Birthday gift’ by voting in him in on the 26th of October with over 10 million votes. “God works in very mysterious ways. It is by design that the repeat election will be held on the president’s birthday. Let’s join the party by handing Raila Odinga a resounding defeat this time round,” said Wainaina. Juja MP Francis Wakapee acknowledged the fact that Thika Town, Juja and Ruiru Town were generally cosmopolitan constituencies with almost all the 45 Kenyan tribes harmoniously living there. He persuaded the ‘diaspora’ voters to t vote for Uhuru Kenyatta so as to empower them (the three MPs) to be able to serve them better. “We as your MPs never turn you away when you (diaspora voters) come to our offices for bursaries or any other assistance. We serve you just as we do to the rest of your neighbours who hail from this region. Why then do you have to vote elsewhere considering that a vote for Uhuru Kenyatta will help us serve you better? Let’s put our votes in one basket and forge ahead as brothers and sisters,” said Wakapee. He lamented that the current stalemate in the country had stalled some essential services and called for an end to all this on the 26th (of October) by voting in for the Jubilee candidate. “At a time like this, we would have done away with bursaries for needy students but now, as parliamentarians we cannot access these funds due to the current stalemate,” he said. Wakapee was alarmed by the high number of ‘spoilt votes’ in the August elections thus warned the electorate to be extra careful in the October polls. The Ruiru MP thanked all those who voted in Jubilee Party leaders but reminded them that they still had one duty left to complete their mission. “Our mission is not yet complete until we installed our captain into deck. We need those over 40,000 votes that never cast their votes for Uhuru Kenyatta last time to do so this time round and end this once and for all,” said King’ara. He asked everyone to play a role in ensuring all those with challenges we helped to reach the polling stations and exercise their right to choose the leaders of their choice. Others in Saturday’s UhuRuto campaign caravan included Kamenu ward MCA Raphael Chege Waithumbi, his counterparts Joseph Kahira Wambui (Gatuanyaga) and Joachim Mwangi Njama (Ngoliba) among other party leaders. On 1st of this month, the Supreme Court declared Uhuru Kenyatta’s victory in the presidential election invalid and ordered a new vote to be held within 60 days.